In our last post, we covered what CSAs are and what advantages they offer to both sides of the market (producers and buyers). We also mentioned briefly that they help the local economy grow, but how do they do this? Whenever you buy from a CSA, you are helping that money you spent stay in the community. Whenever you buy vegetables from a CSA as opposed to sourcing them from a supermarket, you are contributing twice the amount of money to the local economy. The reason this happens is that, at the end of the day, a local producer is more likely to spend the proceeds from their sales in other local businesses and service providers than a company that operates nationally. The flow of money, this way, stays close to home rather than spreading out. That money you gave to your farmer? It does not stay just with him. It goes back to that local restaurant you like having lunch in, that coffee shop you like visiting, that charity you like giving a few dollars to. Buying locally not only gives you that product, but it tells local producers what is consumed and what is not, what they can offer and what they could offer. With this information, local farmers can change their businesses and adapt to our demands much faster than out-of-province producers typically could. This flexibility and increased response time can create fantastic business opportunities ready to be exploited not only by our farmers, but by local food entrepreneurs who might bring new tools and business models that can be supported by our community. All we need to do is buy local and work with our farmers. 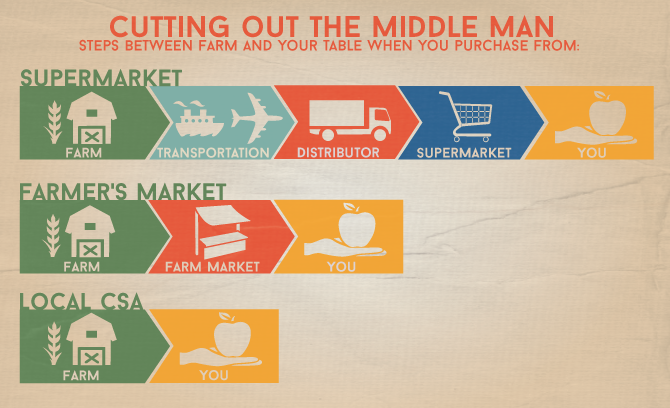 So now that you know how much your community can benefit when buying local, Do you want to give CSAs a try? Click here to join a CSA today & receive farm fresh PEI vegetables!